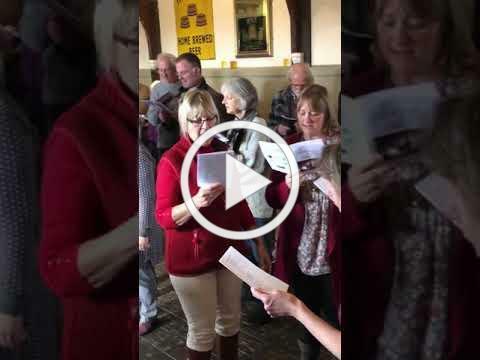 SOME FESTIVE SINGING.........What could be better than that!! Well this for me has been two months of continuous singing, how lucky is that! We have been getting ready for a concert in Lydham Church with Castle Voices, the choir I sing with. I saw this singing group perform there two years ago and thought ......well that is a choir that I would like to join. Sue Harris is such a brilliant teacher and musician and makes everything so much fun. Do join us if you can. Details below. A second newly formed group, led by acclaimed Shropshire folk singer John Kirkpatrick, has been an intense six Monday evenings, learning, what for me, were completely new carols. These are all old 'village carols' and have been resurrected here in South Shropshire by some sixty to eighty people. We make a loud, raucous sound, each part trying to out do the other, but all in good cheer!!! Last Sunday was our first time of singing to a gathered public, although we are not really performing but just having loads of fun. Every Sunday from 12.30 to 2.30 and then again on Boxing day from around 2.30ish you will find us singing in the top room of the Three Tuns, in Bishops Castle, a wonderfully healthy way to be spending our Sunday afternoons. Please join us. .........and for those of you really keen here is a brief taster of the raucous noise that we make!!! Out of 120 places I need to fill, on my short courses in 2019, I have just 12 places left in all. Of course there is the possibility of a cancellation or two, but why risk that when there is a course that you are craving to do. I also have a space or two on Ruth Issetts going textile workshops and on my drawing/painting workshops. Kay will be working from beautiful historical lace examples and using these to explore some of the key visual ideas associated with lace and use simple methods to record these as the starting point for small-scale themed workbooks. Matthew is another inspirational and amazing tutor who brings a uniqueness to his teaching. He will will exploring the idea of 'continuity and change' through drawing, collage and stitch. He will be asking you to respond to a collection of personal objects by looking at ways which abstracted visual imagery might convey, explore and develop the idea of personal language, narrative and history through the interaction of making, materials and process. This will be Alice's third visit to Moor Hall. This time she will have you exploring techniques for capturing natural colours on cloth and paper, bringing colour, mark and hand stitch together. You will be using gathered materials and plant matter from the immediate surrounds of Moor Hall and its 5 acres, to make our own inks and colours and experimental mark-making tools. In addition to this you will also be doing some eco-printing on paper and cloth and you wi ll bring these organic marks together with hand stitch in simple but unique hand made book structures. Hand stitching will be the emphasis on this course. Developing exciting surfaces by building up and layering stitches can be most rewarding. Finding the right stitch or stitches to interpret the image or surface selected is the challenge. Initially, we will work some experimental exercises and then progress to creating small, resolved, subtle and/or exquisite embroideries. Decaying surfaces, old walls, pavements, rust, mosses, lichen, grasses, flower centres, rocks, stones, minerals, tree bark could all provide inspiration. Extreme close up images can reveal unusual, fascinating imagery. There may also be the option of machining onto soluble film to support the hand stitch creating a unique lace. I have just had a cancellation on this course so can offer this place to the first lucky person. This four session course will focus on exploring different ways of developing design ideas using paper, fabric, colour and stitch. The course will include the exploration of different formats, how to create calm and intense areas, proportion and surface manipulation. Finally, the discussion of presentation techniques, will have students eventually creating their own personal collection of finished work. Develop a series or significant textile pieces using fabric, thread and stitch techniques. Work from your own selected theme or ideas and investigate a number of different ways to design for textile work. In the first two day sessions you will use a number of different materials and techniques to explore your ideas that could then be interpreted into fabric and stitched pieces. The March and May sessions will focus on the interpretation of these design ideas, focusing on your own personal development. A variety of different techniques will be suggested and you will be encouraged to sample and trial these with new materials, refining ideas towards a selected outcome. Two separate art courses offering insight into innovative art projects, exploring many ways of using techniques/media. Critique of work, artist research, lively discussion are essential parts of each session. These courses have been well attended for over ten years now with some regulars being joined by new members. Courses are suitable for beginners as well as those with experience. Tha nks for looking in I hope you all have a perfect Christmas and New Year.